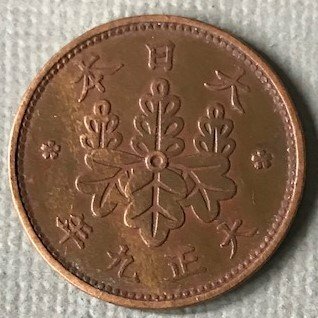 I have a variety of old Chinese coins, and I can ID the bronze ones, but this one I can't find. I'm assuming it is copper, obviously struck not cast. Well, it's claiming to be a 1 Sen from 1916 Japan. 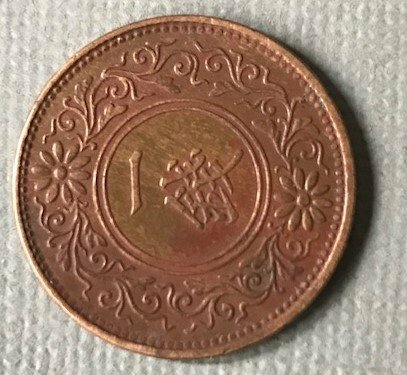 Obverse is showing Dai Nippon (Great Japan) across the top and Year 5 Taisho across the bottom (1916). The reverse is sideways. It says 1 Sen. If you properly flipped this coin for the photos and the reverse is in fact sideways, that's a nice rotation! FYI, the coin should be bronze and is the "key" date for that short series. Thanks much, that answers my question. I don't want to disappoint you, but it is from the 9th year of the Taisho era (1912-26), thus 1920. Very decorative coin, though!